Do you really need built-in garage cabinets? Do they really help you? Are they really worth the cost? Should You Buy Garage Cabinets? High-quality garage cabinets, particularly if they are built-in garage cabinets are not cheap. You wouldn’t want them to be. Why do good garage cabinets cost so much? You’re paying for quality, and the fact that they are custom made for your home. Do you really need garage cabinets? The answer to that question really depends on a lot of factors. For one, if you wish to increase your home’s resale value, then yes. Do they really help you? Well, they help to reinforce the structure of your home and help you to clear up potentially dangerous clutter in your garage. Are they really worth the cost? Absolutely. The benefits that garage cabinets provide are innumerable. Custom garage cabinets will make any potential home buyer look at your home and put it high on their wish list. The reason is that even in a hot real estate market like Phoenix, one of the factors that drives home prices is the features that each home has. And professionally installed garage cabinets are a highly desired feature. Garage cabinets improve your home because they help with aesthetics. If you get garage cabinets installed, it transforms your garage from a cluttered pile of unrelated junk to a neatly organized showpiece. High-quality melamine garage cabinets are also easy to clean, durable, and tough. While prefabricated storage cabinets are obviously far cheaper then custom cabinets are, you will soon find that the money you save is extremely short-lived. There is a law of diminishing returns where prefabricated cabinets are concerned. A lot of pre-made cabinets are made of fiberboard with a plastic veneer. As a result, a lot of them start to get scuffed and scratched. Then your garage starts to look shabby again. Fiberboard has a tendency to crumble. Fiberboard is made of leftover shavings and pieces of wood that have been glued together. The veneer is often the only thing holding it all together, so when that goes, so do your prefabricated garage cabinets. Oh, not all at once. A chip here, a flake there. But pretty soon you’re reduced to a cheap way to make them look “better.” Duct tape, anyone? So if you want to make an improvement to your home, do it the smart way. 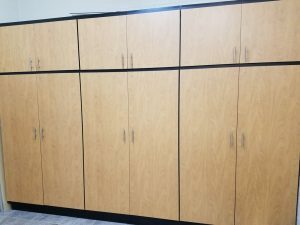 Install custom garage cabinets in Phoenix.